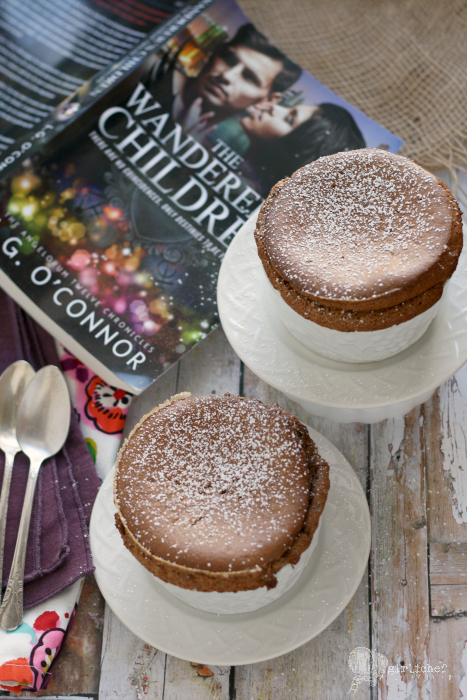 The cast of The Wanderer's Children talks FOOD, plus a recipe for Chocolate Soufflés! 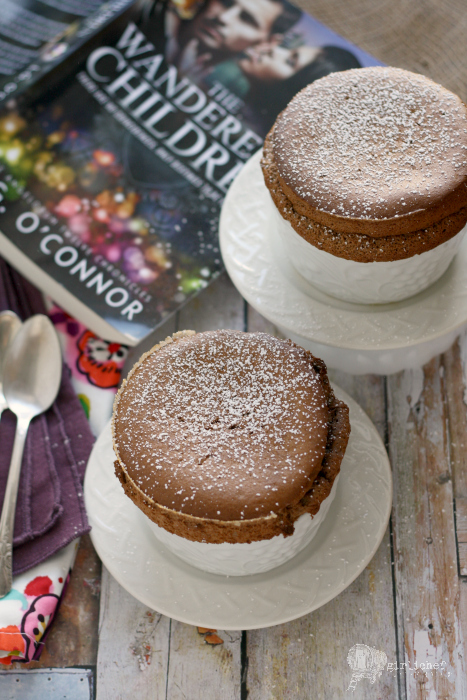 Heads-up—this is a lengthy feature, but it includes a review, an interview, a sinfully delicious chocolate soufflé recipe, a 50% book discount code, and a ridiculously cool giveaway. If you could carve 10-15 minutes out of your day for a little escape, I'd love it if you'd take that escape with me here today. I love finding a good book series. Sometimes I "discover" them late in the game and come home from the library with a stack of them—because I have to start from the beginning (I'm the same way with tv series). Other times I'm lucky and discover them from book one. That's what happened with The Angelorum Twelve Chronicles by L.G. O'Connor. Now, at first I wasn't so sure. That hesitation had nothing to do with the fantasy or paranormal aspect of the books—angels, demons, and looking beyond are a draw in my book. It was the romance part of the equation I wasn't so sure about. Before I read Trinity Stones, I'd never read a romance novel in my (at the time) 38 years. I just never had any interest in them. My experience with them only goes as far as standing in front of the small bookshelf at the supermarket when I was in elementary school. I'd study the men with muscles defined under their flowing shirts, long hair whipped back in an unseen wind. I was fascinated, yet I can't remember ever picking one up and flipping through it. I'd reach for a Stephen King novel instead. But apparently, I don't mind a little paranormal romance. Though I do still feel like I need to read it when the kids are in bed or at school (or look over my shoulder the whole time...because everybody knows kids magically appear there at the most inopportune times). Nine months ago I stumbled into the world of the Angelorum not knowing what to expect. And like so many times before, I've been mentally willing the author to write faster! I love to savor a new book in a series, but have a hard time not just devouring it after the wait. Book two did not disappoint. O'Connor introduces us to a few new members of "the twelve" in this book. There are actually a sizeable number of characters (aka cast members)—but the story calls for it. In book one, we were introduced to Cara and Simon. I'd consider them the main characters. Michael, Sienna, Kai, and a several others were also introduced, but seemed to be more supporting characters. In this book, Michael and Sienna come to the forefront and we get to know more about what makes them tick. Kai, Brett, Angel, Paco...all of their stories are simmering on the backburner, as well...waiting to have their turn in future books. And really, that's just a glimpse. The books are actually pretty meaty. I like to think of it as immersion. The Wanderer's Children is almost 400 pages long, which is slightly longer than Trinity Stones—but it doesn't feel long. As a matter of fact, I find myself wanting it to continue (the sign of a good series). I do want to stress than this is a book that is classified as 18+, both for the steamy bedroom scenes and for the themes. A couple of the story lines went pretty deep this time, making me feel a bit uncomfortable and uneasy with the subject matter of buried sexual abuse. I think the ability to conjure up those feelings is a sign of good writing. I'm pretty blown away by the versatility of O'Connor's writing, actually. I've been put under a spell by the storyline and the characters of The Angelorum Twelve Chronicles. Oh, the characters...the beautiful, beautiful characters. It's hard for me to pick a favorite, because there's something I like about each of them. Oh, and I don't think I even mentioned the food (if you can believe that). They're aren't "foodie" books, but O'Connor does an awesome job of giving food a presence. Simon is a classically trained chef, after all. And since you know I can't go long without relating something back to food, I'm SO EXCITED to share this feature with you today. 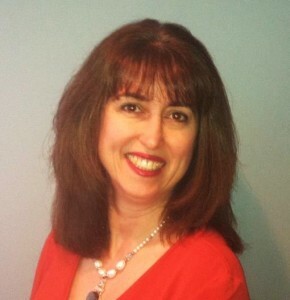 The Wanderer's Children author, L.G. 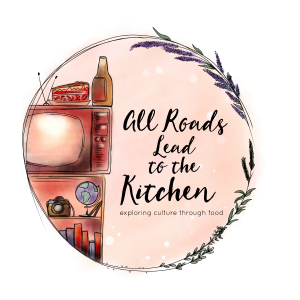 O'Connor and some of our favorite book cast members recently took a little time out of their busy schedules to talk with me about that subject that everybody loves—FOOD! I was so happy that they'd even entertain the idea of letting me pick their brains on the subject. The interview is followed by a really fantastic giveaway that you won't want to miss (seriously, we're talking signed book and sparkly necklace). 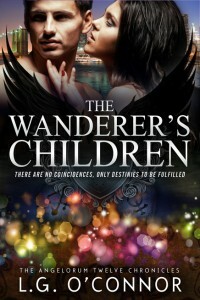 So, without further ado, please join me for an interview with the author and cast of The Wanderer's Children! [Heather] Next up, I have a special treat for everyone. L.G. asked some of her cast from The Wanderer’s Children to come to my kitchen and spend some time with us to talk about what we love most… food. [Simon] (shakes his head and chuckles deeply) That’s a tall order, L.G. [Heather] Thanks, L.G.! Just a quick intro for my blog readers. Cara and Simon are the stars of the Angelorum Twelve Chronicles, L.G. O’Connor’s urban fantasy / paranormal romance series. Cara, before we get started, why don’t you tell everyone what you do and how you met Simon? [Heather] Great. Now I have a food-related question for you. If you could learn to make one meal or dish better than anybody else in the world, what would it be and why? [Cara] (look of panic crosses her face) Oh, I thought we were here because of Simon. Didn’t L.G. tell you that I’m a disaster in the kitchen? Seriously, Heather, I could burn water. [Cara] (gives Heather a deer-in-headlights look) Uh, can you ask Simon his questions and come back to me? I need some time to mull that one over. [Heather] (laughs) So, Simon, can you describe your perfect day in food from the time you wake up until the time you go to sleep? [Simon] Mmm. That’s a truly great question. (looks at Cara) Love, remember the second day we spent in Monaco on vacation after the Tribunal? That was a perfect day in food. [Heather] Simon, you mentioned Monaco. I understand you’re a trained French chef. So, you enjoy Provençal style cooking? [Cara] We had that onion thingy, right? [Simon] (chuckles) You mean the onion tart with olives, anchovies, and herbs? (Cara nods) It’s called a pissaladière, my love. (Simon gives her hand a squeeze and turns to Heather) We paired that appetizer with a Niçoise Salad and a nice rosé. A cheese course followed and then a tarte de pomme for dessert. My second choice would’ve been a goat cheese quiche and marinated salmon. [Cara] (claps her hands excitedly) I figured it out. I have an answer to your question. Coq au Vin. I want to learn how to make coq au vin. Its Simon’s favorite. He chose the Bouillabaisse because he was in the mood for fish that night. Otherwise, he would’ve had coq au vin. [Simon] (beams at Cara and then touches his lips softly to hers) I can teach you how to make it. [L.G.] Okay, you two, this is a family cooking blog. Heather, next question please! [Heather] (clears throat) Good idea. Thank you, Cara, Simon. Also joining us from the cast is Michael, Sienna, Brett, Angel, Chloe (Cara’s whippet), and Achanelech. Welcome, everyone! I have two questions for each of you. First, what do you do and how did you meet Cara or Simon? Second, what foods do you absolutely crave, and which do you absolutely loathe (if any)? Why don’t we start with Michael? [Michael] (shakes Heather’s hand) Hi, Heather. It’s a pleasure to meet you. I own Rising Sun dojo in Brooklyn where I teach martial arts when I’m not keep those two out of trouble (points to Simon and Cara, smiling). I was assigned to Cara as her Trinity Messenger not long ago. Simon and I met only a week before I met Cara. Even though we haven’t known each other very long, we’re incredibly tight. Foods I crave: anything that can be liquified into a smoothie. [Cara] (chuckles and covers her mouth) The greener the better. [Michael] (shrugs) Nothing wrong with that. Things I loathe: processed food of any kind. Sienna, you want to go next? [Sienna] Heather, great shoes! Designer? (Michael nudges her gently) All right… I’ve known Carissima since high school. We grew up in Summit, New Jersey and met when we were sixteen. The circumstances were a little embarrassing, so don’t ask me to go there, ’kay? (winks) Foods I crave? Basically anything involving smoked salmon. Foods I loathe? Michael’s freaking green smoothies (throws her hands up). Just sayin’, babe. Blech! [Brett] (chuckles) Michael, dude, I have to agree with her. They’re god awful. I guess I’ll go next. Hey, Heather (waves). Brett King, front man for King Metaljam. I met Cara at an outdoor café in Connecticut a few months ago when her dog Chloe almost kissed me to death. Foods I crave? Good vegetarian lasagna like my Aunt Adela used to make me growing up. Mine never tastes as good as hers. Foods I loathe? 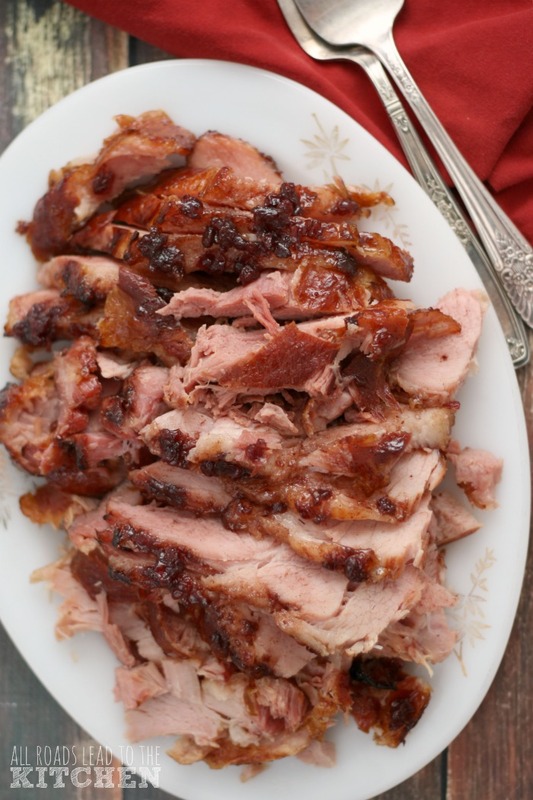 (Brett glares at Angel who’s snickering next to him) Anything with meat in it; especially burnt pig flesh. [Angel] Mijo, I’m going to get you to eat bacon at least once before you die. [Brett] (snorts) Yeah, good luck with that. [Angel] Heather, excuse our rudeness, señora (Angel kisses the back of Heather’s hand). You are a woman of great talents, I see. Thank you for your kind invitation. I met Simon and Cara the night of the rescue. Unfortunately, señorita Collins was unconscious at the time. 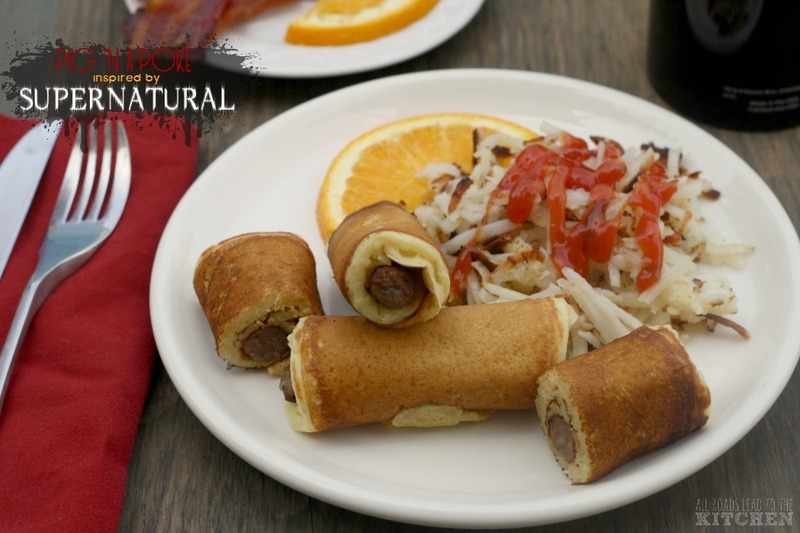 Food that I crave…Mmm. The key to my heart, kind lady? Arroz con pollo, a shot of fine tequila, and caramel flan. Mmm. That would earn my eternal gratitude. Things I loathe? That tofu s$*t that Brett eats. (L.G. glares at Angel) What? The s-word? (waves hand) Bah! [Simon] Heather, I’ll answer the questions for Chloe if you don’t mind. (Simon tips his head down toward Chloe) She says she’s a Sentinel for the Angelorum and she can sense demons. She met Cara as a puppy. Foods she craves: meat, cheese, chicken, and fish. Um, in that order. But if she has to choose, it would be the sweet sausage I use in my Italian meat sauce. Foods she loathes: canned dog food, all kinds. (Chloe licks Simon’s hand) Achanelech, I guess you’re next. [Achanelech] (Glowers at them all) I’m a businessman with many interests and holdings. Miss Collins and I met in a New York subway when I was investigating the competition, so to speak. The temptation to throw her to my demons as snack at the time was quite strong. [Brett] Who invited him, anyway? [Achanelech] I was wondering the same thing about all of you. Food I crave? Your delicious soul, Heather, would do nicely (forked tongue flicks out through his lips and smiles wickedly). [L.G.] Behave off, Acchie, or I’ll let Luc kill you off in the next book. [L.G.] (narrows her eyes) Don’t try me, demon. Just tell Heather the food you loathe. [Achanelech] (lets out a breath) Fine. Frog’s legs. [L.G.] (gives Acchie a self-satisfied smile then turns to Heather) I think that’s everyone. Thanks for having us, Heather! It’s been fun. Chloe has one question. She wants to know if you have any treats for us before we leave. Why, as a matter of fact I do, Chloe! 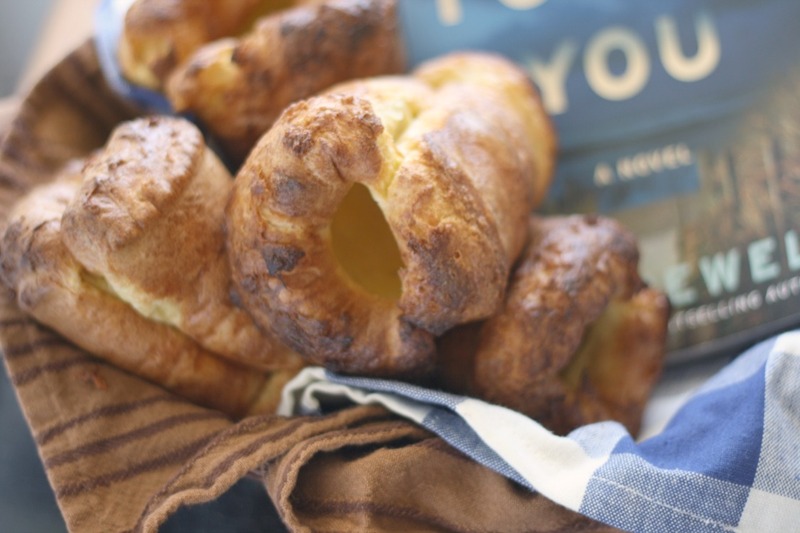 While I was delighted to find so many food references in the book, I kept being pulled back to those chocolate soufflés that Simon made (and Michael removed from the oven) right before Zeke's bloodied body fell from the elevator in a heap. Since I don't think anybody really had time to enjoy them, I thought I'd recreate them for you today. I hope Simon approves. Oh, and for you Chloe, I made one of my Irish Cheese Soufflés (I wouldn't want you to get sick from eating chocolate). Thank you so much for taking the time to talk food with me today—all of you! I've had a blast, and I can't wait for book 3! Or should I say book 2.5, L.G. (I think I read that somewhere...)? 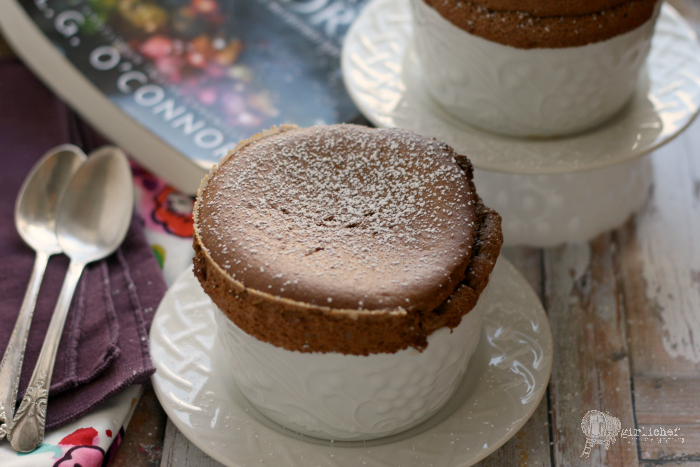 Break through the shell on this puffed soufflé and dig your spoon into a rich, chocolatey center. In a medium sized, heat-proof bowl, dissolve the espresso powder in the boiling water. Add the chopped chocolate to the bowl and set over the top of a pan with boiling water (double boiler). Stir until the chocolate melts. Set aside and allow to cool for 5 minutes, and then stir until smooth. While you're waiting, butter the inside of six (8 ounce) or 8 (6 ounce) ramekins and coat them with some granulated sugar (this is necessary to help the soufflés climb the sides of the ramekins). 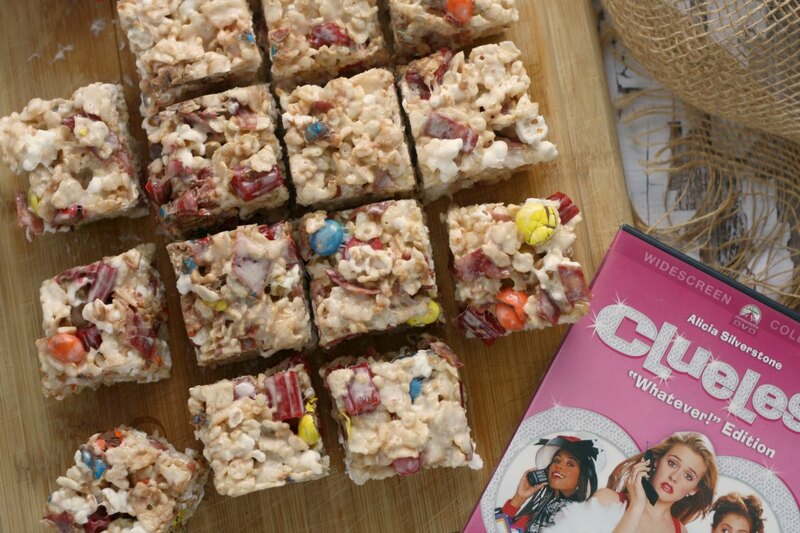 Place them on a baking sheet that has been lined with parchment paper or foil; set aside. Preheat oven to 375° F (unless you're making the mixture in advance). Combine cornstarch with 1/4 cup of the (cold) milk in a small saucepan, whisking until completely dissolved. Whisk in the rest of the milk and 1/2 cup of the sugar. Set over medium heat until sauce comes to a boil and thickens, stirring regularly. Allow to boil for 30 seconds; use a rubber spatula to scrape any sauce from the sides of the pan. Immediately scrape the custard into a large bowl and whisk in the soft butter and melted chocolate mixture. Whisk in the egg yolks. In a separate bowl, whip the egg whites, cream of tartar, and salt until the whites for soft peaks. Sprinkle the remaining 2 tablespoons of sugar over them and continue to whip until stiff peaks form. Stir 1/3 of the egg whites into the chocolate mixture; stirring makes the mixture lighter, allowing you to carefully fold in the rest. Add another 1/3 of the egg whites, very gently folding them in. Fold in the remaining third, still gently, until no more white streaks remain. Slide the baking sheet into the preheated oven and bake for 35 minutes without opening the oven door (no matter how tempted you are). At this point, the soufflés should be puffed above the rim and set. 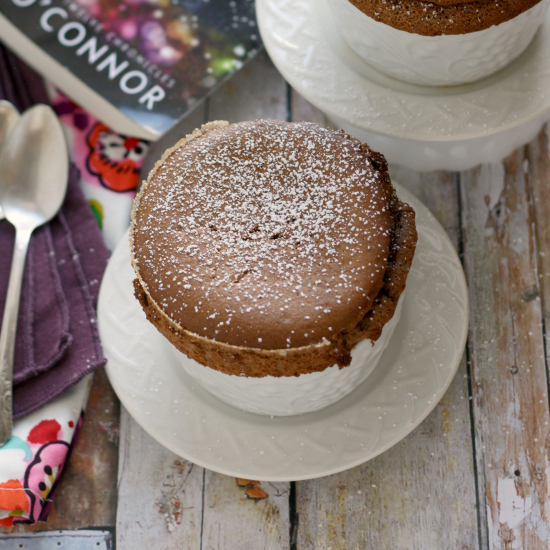 Serve immediately for the most impact (because soufflés do deflate as they sit)! Sift powdered sugar over the top, or serve with lightly sweetened whipped cream, if you wish. 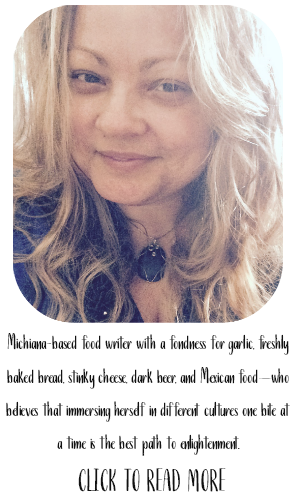 "foodie" read: Maybe not your typical foodie read, but if you're anything like me—you'll pick up on the foodie love. random excerpt: One thing she'd learned about her fiancé is that he either cooked or painted when stressed, making the kitchen and his art studio his two safe places. The only other place she'd seen him utterly in his comfort zone was leading a mission. His shoulders tensed as she sidled up behind him. "Are you still mad?" When the newly forming team finally comes together, an unexpected revelation shakes them to their core. They must all look deeper into their souls as new secrets come to light to discover what’s really at stake in the final battle between good and evil…if betrayal and Lucifer don’t rip them apart first. If you're interested in reading more about The Wanderer's Children (including reviews, guest posts by the author, and questions and answers), check out the rest of the stops on the book tour. If you purchase an eBook, you can also get it "signed" by visiting L.G. O'Connor's website and looking for the "Authorgraph' widget in the sidebar (and following instructions). This goes for both books in case you decide to buy the first book in the series, Trinity Stones, while you're at it. Phew! Okay, I know that was a lot of information. But it's finally time to talk about the amazing giveaway... In The Wanderer's Children, Cara is going through a lot of changes with her body due to her new Nephilim DNA. Since she is actually growing, her beloved engagement ring will no longer fit on her finger, so she strings it through her necklace—and is constantly fiddling with it. Cara's necklace also contains a diamond solitaire. This giveaway is open to residents of the USA, ages 18 and older. Submissions will be accepted through 11:59 pm ET on Monday, December 22, 2014. One winner will be chosen via random draw and notified via email within 48 hours of the close of this contest, and given 24 hours in which to respond. If no response is received within that time frame, a new winner will be chosen. All entries will be verified (if the mandatory comment is not received, yet the box is checked, all entries by that person will be voided). If you enjoyed this, drop by and see my introduction to the world of the Angelorum, my stop on the Trinity Stones book tour, and this Egg White Frittata w/ Mushrooms, Spinach, & Goat Cheese inspired by that book. I received a free copy of this book as part of the TLC book tour. This giveaway is being sponsored by the author, L.G. O'Connor. All opinions are my own.